Well unless something happens real quick it looks like tomorrow will be the big day. We will be going to the hospital bright and early Monday, and once I have some information I will let everyone know the big news. I just want to say again that I am humbled and grateful for all of you stopping by to check in on me and my family. I really appreciate it. Wish us luck, and I will talk to you soon. 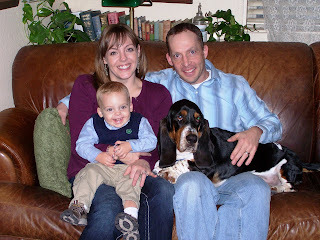 This is a picture of the Shifley family about this time last year. Next year's Thanksgiving portrait is going to look a little different. What a great family photo. The main difference next year is that there will be a lot more smiles! Keeping you all in my thoughts tomorrow! You don't need luck. You have each other. Can't wait until tomorrow to welcome the new baby!! I love that picture. Next one will be even better. Sending my best wishes for tomorrow. Can't wait to hear the news. Great photo. Did you change the look of your blog? I'm so used to your old one after all these years. Good luck! Thinking good thoughts for you! Pic of a happy family, may it be bigger and happier soon. That is a wonderful family pic. My thoughts and prayers are with you all today.